We celebrated a birthday in our family earlier this month. And we gave little chocolate- and candy-filled treat bags to our guests as they left. Licorice allsorts to the Grandma that loves them. Salt water taffy for one aunt and Swedish berries for another. Brightly coloured cellophane-covered chocolate toffees. Gummy cola bottles, shoelace licorice, foil-wrapped chocolate-peanut butter hearts. Smarties. Each person received their favourite(s) in their little bag. But I’d been to the bulk store and now had some extras. We made quick work of most of the left-over pieces when the little ones had gone to bed, but the item we had most of is the one that my pre-schooler knows about and likes. Smarties. So I hid them in a he-can’t-reach-and-expolore cabinet, but I didn’t want to forget about them (the waste!) and wasn’t about to pass them over to him to gobble up. 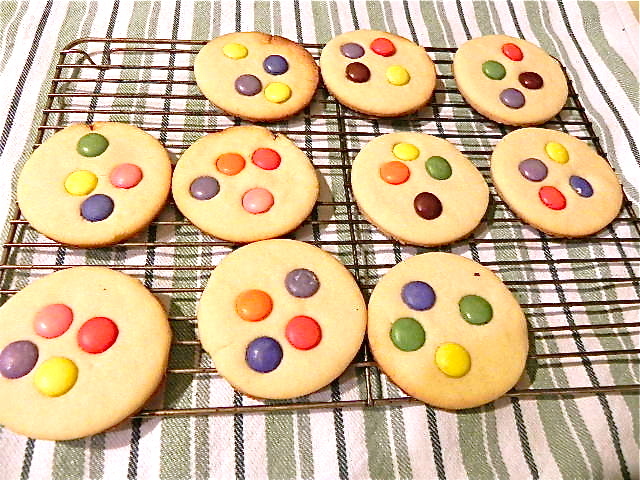 Instead we made a small batch of butter cookies and pressed the chocolate candies on the tops. Sharing the cookies – and candies – among the family seemed like a better way to use up the treats. I would hate to throw out the extra candies, but also feel that none of us really need to eat them, either. Making cookies sort of defeats the purpose of not having too many sweets, I know. But it also means everyone has just a couple of cookies over a couple of days and then the (small) batch is done. It really is a treat this way, because we don’t keep candies or cookies in the house the way we do cereal and cheese and apples. And though the Smarties were gobbled up, it was only a few for each of us. Until the next time, at least.